I love carrot s. Love them. And when paired with orange juice and maple syrup? Divine. I made these baby carrots with ham for New Year’s Day and they complemented each other wonderfully. It’s a simple dish and the perfect side for any dinner. Place 1 in. of water in a saucepan and add carrots. Bring carrots to a boil. Reduce heat and cover. 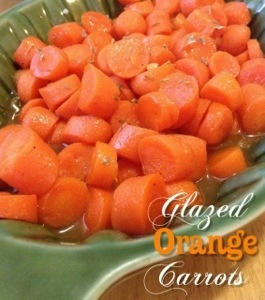 Simmer carrots for 7-9 minutes then drain. Melt butter in a large skillet. Stir in the orange juice concentrate, brown sugar and maple syrup. Add carrots and toss to coat. Cook and stir for 1-2 minutes or until glaze is thickened. Garnish with parsley.